Are there places that you dream of visiting? I know Yosemite was mine until I finally lived close enough to go when I pleased. Just recently I made a trip to visit for a couple days. It was a spur of the moment trip that was actually the first section of a week-long trip that ended with the Sequoias and Kings Canyon, my last blog post. 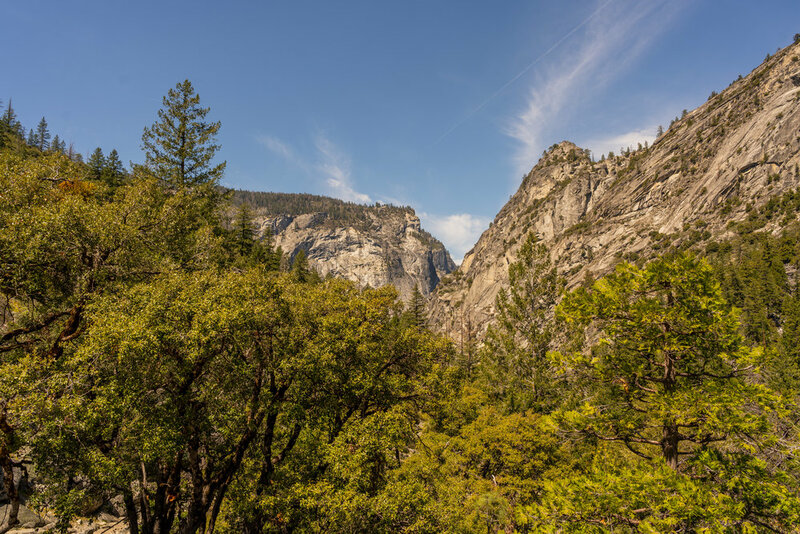 If you enjoy seeing waterfalls, towering granite faces and plenty of irreplaceable moments then Yosemite should be the place you hit in California. Yosemite is breath-taking, it really is an absolutely incredible place. I’ve never been anywhere like it and I know thousands of other people are in awe just like myself. Getting to make spur of the moment trips and having to drive less than 7 hours from home it just makes sense to hit this beautiful place. Starting off the visit I hit Bridal Veil Falls after going through the park entrance. If you’ve never been to Yosemite, this is one of my favorite waterfalls in the park. Although it’s right near the entrance and unfortunately, I didn’t get any photos this trip, it’s just something you have to stop and see. It’s about a 5-minute hike to the viewing point and be sure to bring a poncho or something waterproof because I couldn’t even get close due to the falls being so full this time of the year. Anyways, see it, it’s incredible. After hitting Bridal Veil Falls, I knew I wanted to check out Mirror Lake because it was actually something I hadn’t seen yet. This is a short hike, only taking a couple hours and not having too steep of grades and minimal elevation gain it’s good for the whole family. Heck, I even saw strollers on the trail, you’ll have to carry them for short sections but there were multiple people doing so. You also won’t be able to really go in the lake due to it being so shallow but there are plenty of sections to dip in really quick as well as the trail continuing on further into the valley. You can take this trail until you reach an area where there was a rock slide from up above. 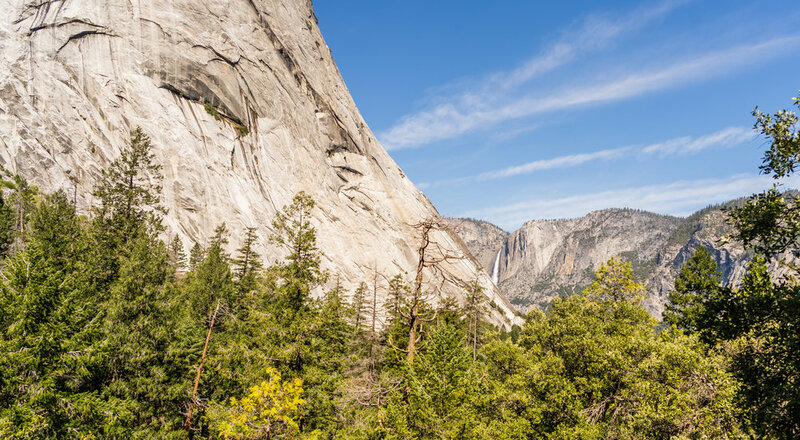 This hike is definitely rad and offers some killer views looking down towards the entrance to the park as well as some intimidating views of Half Dome right above you. After coming back down from Mirror Lake it was about time to go find a campsite for the night. Having spent all day adventuring and sight seeing I knew there wouldn’t be anything in the valley left over so I hit one of the campsites in the Northwest part of the park, still staying within the park it would only be about 30 to 40 minutes to drive back into Yosemite Valley to hit some of the bigger waterfalls and one of my favorite hikes the following day. Well, waking up I started packing the car. Getting packed quickly and eating a quick granola bar and avocado breakfast I went to start the car and head into the valley. But, the battery was dead, good thing I carry a big jump pack due to being by myself in backcountry areas on most trips. Well, it was dead too. Then I remembered I had yet another jump pack that’s smaller but I use for charging up my camera batteries on hiking trips. Quickly found out I took the jumper cable attachments out when I went on my Baja trip and forgot to replace them. So, I walked around to campsites where people were already awake and luckily there was a family with some jumper cables, now I just needed a car to jump it with. So, I went to the campsite next door and they were willing to help me jump it. It started after a few minutes and I was headed down the mountain to go get a good day of exploring in. This is a huge lesson that if you are going to plan spur of the moment trips you will probably forget things. Just make a list of essentials, if I had been off the grid and not in a campground I would have been stranded. So, buy a small jump pack, charge it once a week and make sure you have everything you need to get your car started in an emergency. Back to adventure time! Getting into Yosemite Valley, I headed straight towards the parking lot to the start of the Muir Trail. The beginning of the Muir Trail is a great hike to get in some serious elevation gain in a few short miles as well as some amazing waterfalls just within the relatively short distance. This is probably the most popular hike in the entire park so be prepared for lots of people but it’s worth it, even when its packed. 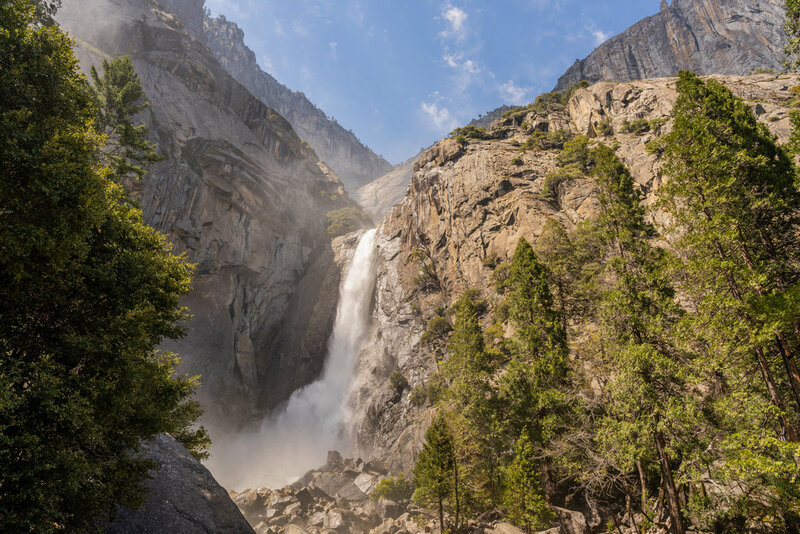 Once you get past Vernal Falls the crowds start to thin and you start to finally enjoy listening to the birds sing and the sound of the snow melt rushing through the granite lined canyon along your side. Today my turn around point would be Nevada Falls where you make one last big kicker to get to the top. Stopping at the bottom is also fun, it’s one of my favorite snack stops before making the steep climb to the top. Today I wasn’t going all the way up to squeeze in a couple more trails after getting to the car so I had myself an orange and packed back up. Anyways, the descent went well and I got back in the car to head towards Yosemite Falls. 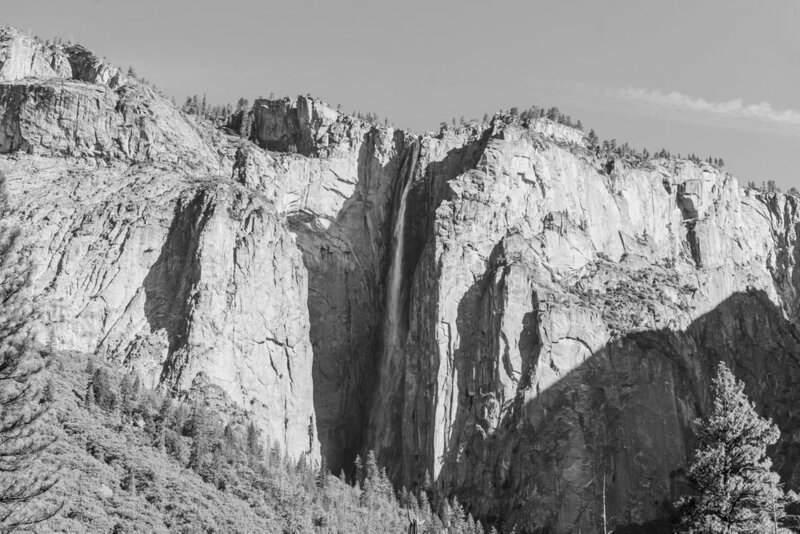 Yosemite Falls actually happens to be one of the tallest waterfalls in North America. Towering overhead at a total drop of 2,425 feet it is seriously epic and insane to see. The falls are broken up into three sections, the Upper Yosemite Fall being the tallest section at 1,430 feet, Middle Cascades being 675 feet and lastly the Lower Yosemite Fall at 320 feet. I didn’t get the chance to do the hike to get to see the upper fall closely but I did take the short little walk to get towards the lower fall which was still epic to see and easily accessible for everyone. If you have the chance to do the hike I would be super jealous but I know it’s next on my list when I get to the park again. So, go explore it before I do! After hitting Yosemite Falls, I decided to go try and find some more falls. Finding Ribbon Fall and Royal Arch Cascade I knew that there was no other way to end off the day other than eating an avocado and watching climbers descend from their day on El Capitan. This thing is seriously a monster, it’s 3,000 feet from base to summit. And yes, people climb this thing so make sure you go check it out as it’s one of the parks most amazing features. I couldn’t even explain how massive and beautiful this thing is, just go see it and experience it for yourself. Yosemite did me well just as it always does. It will remain my favorite National Park as it’s somewhere that I just can’t ever stop visiting. I’ve done the hike to Vernal and Nevada Falls numerous times and will continue to do it every year. Being located between San Francisco and Los Angeles make sure you stop in Yosemite on you way through. I promise it’s worth it. If you didn’t see my last post, the second half to this trip, here is the link so you can add to your destinations to explore in California. I can’t wait to get out and explore Arizona coming up, I’ve got some rad stuff planned. Stay tuned and thank you for the continued support!